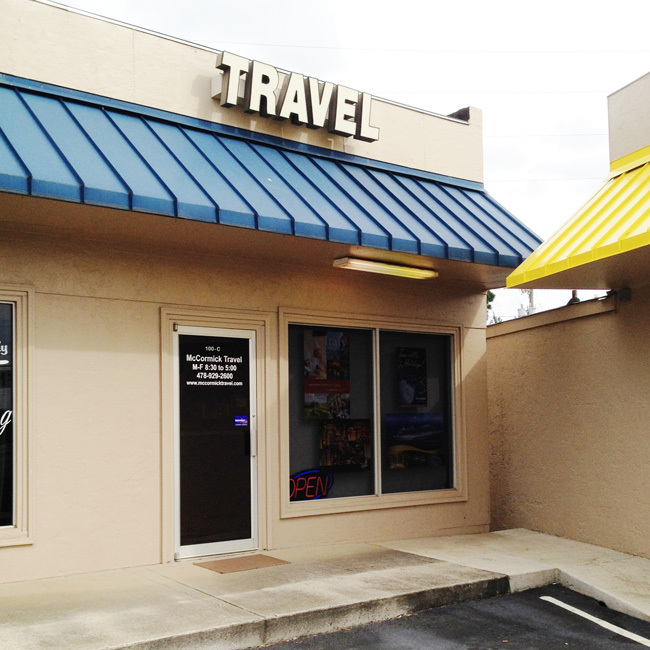 What began as a small travel agency in Perry, Georgia in the 1970's became American & International Travel and later moved to Warner Robins. There it became a major player in serving the needs of travelers in Middle Georgia. It became a Carlson Wagonlit franchise in 1995 and was acquired by McCormick Travel in 2004 when it's owner retired. The office has since moved to Centerville (across the street from the Mall) where our experienced and professional staff continues the tradition of going the extra mile for it clients. We are a full service travel agency specializing in cruises, groups, family vacations, luxury escapes and personalized business travel to anywhere in the world. So, give us a call, an email or stop by the office and let us show you why we want you returning from your trip not just satisfied, but ecstatic. McCormick Travel Agency in Warner Robins, Georgia is the best travel agency around. Kristie and Jennifer have handled our travel arrangements for over 30 years. Many of our trips were out of the country. They are very thorough and have an eye for detail. We have never had a problem with any of our travel arrangements handled by them. We would highly recommend this travel agency to anyone wanting the best of the best. Both of us love to travel, it is a big, beautiful world out there. We made plans that after we retired we would try to see as much of it as we can while we were able. We took our first cruise in January 2002, before we retired, and we became hooked on cruising. Since that time we have been on a cruise ship a total of 415 days, and have a lot more cruises planned. Cruising is a great way to travel; you only unpack once and you take your hotel with you. If anybody told me they “were bored” on a cruise ship, I would tell them that is their own fault, because there is so much to do that you can’t possibly do it all. We have taken an 8-day river cruise on the Rhine River in Germany, and planning a cruise down the Danube. River cruises are another very pleasant way to travel. We have also enjoyed a 26-day coach tour of the U.K., and a 13-day coach tour of the Country Roads of Bavaria in Germany, Switzerland & Austria. Coach tours are great because everything is centered on you enjoying the trip. The tour guides are very good at giving you so much information about where you are, and the history of the area, that we were suffering from “Information Overload” when the trip was complete. The coaches are roomy, and you are never on the coach more than a couple of hours at a time without stopping to explore a town, have a meal or a snack, or just stopping to take pictures. The overnight accommodations were always very good. The reason we told you all of this, is that every bit of it was coordinated and planned through McCormick Travel in Warner Robins. A friend suggested Kristie to help us plan our first cruise, and the experience was so pleasant we have never wanted to deal with any other travel company. Both Kristie and Jennifer at the Warner Robins office are extremely friendly, thorough and helpful. They are always ready to find anybody the best deal on any trip. We have dealt with Kristie so much that we think of her more as a good friend, than as a travel agent. In April 2007, we flew to Rome, spent three days exploring Rome on our own. Then we took the train to Florence, where we spent two days on our own with a day trip to Pisa to see the Leaning Tower. Then we took a train to Venice, where we explored that wonderful city on our own for three days before boarding the Emerald Princess cruise ship for a 12-day Mediterranean cruise, ending in Civitavecchia (Rome) and flying home. Everything, and I mean everything, was planned by Kristie. The airline tickets, hotel reservations, train tickets, cruise booking and transportation arrangements to the hotels in Rome, Florence, Venice and the cruise ship were all completed before we left home, and the trip was totally stress free. We just told her where we wanted to go and when. If anyone thinks that they could plan any trip on their own and do it better than McCormick Travel – GOOD LUCK! Kristie, I don’t think I have told you this week just how awesome you are. Well every time I look at my Carnival invoice it reminds me so it is just fair to remind you!!!! Thank you again for all you do for us. No one could ever compare to you. You do a fantastic job and I hope your bosses realize and know that. If not they should!!!! So once again THANK YOU SO VERY MUCHES!!!!!!!! As a Certified Signature Travel Expert, Jennifer has the experience and ability to put together a complicated international itinerary for a corporate client or plan that family "trip of a lifetime". "I love booking any type of travel. People come in as a client and a lot of times become a friend. I try to specialize in listening to what the client really wants and the things that interest them"